Okay, I'll admit it - I used to go OFF on people. Come on, don't act like you've never had a moment where you wanted to be the better person, but, you reacted to a situation in a negative manner. I can remember being pushed to the limit and reacting in a less than favorable manner to the person who pushed my button. At the time, I didn't know that I had control over the buttons that people were pushing. I just figured that if someone said or did something that caused me to feel disrespected, I had to defend myself. Someone is reading this and saying to themselves, "I've never done that!" If you've never been in such a situation, just keep going to sleep and waking up. I guarantee that you will have moments in your life where you will say or do something you regret. The good news, is that you will do better as you learn. The bad news, is that there are so many hurting people in the World, you are bound to run into a few. One thing I have learned over the last several years of working with others and myself, is that I am in control of my buttons. Hurting people feed off of the negative reactions they get while spewing negativity, and your best line of defense is to not react, at all. Did you know that no reaction is indeed a reaction? We always want to have the last word, don't we? What makes us get to a point where we know someone is hurting, so we want to hurt them back? I have a friend who told me once, "If you knew someone was mentally ill, you would treat them like they were mentally ill." This is so true. We don't always know why people lash out, but we do know that there is a level of being toxic that exudes out of the pores of people. We pretend we don't feel this energy when push come to shove, and this person says something we do not like. We want to say what's on our mind, and get it off of our chest like the other person. God wants us to be quiet sometimes. There's always a reason to practice taming your tongue. There's always a reason to pray for someone who is bringing you toxic energy. I have lost friends and personal relationships from being toxic. It wasn't until I was on the other side of the table that I got a chance to see what a toxic Dawn looked like. Words are truly a powerful thing. They give us the power to heal and the power to hurt, and the power to build up and the power to tear down. Controlling what we say from moment to moment is perhaps the most daunting challenge of Christian living. This is the one challenge people who want to live a fruitful life. but who also want to resolve issues. I do not like confrontation, and at the same time, I don't like to leave situations that I want to work on, stagnant. It can sometimes put you in a tough predicament, but it's a great challenge to overcome. You avoid the angry outbursts, cutting remarks, and unguarded responses that lead only to damage, embarrassment, and regret. And what kind of new habits of speech should replace the old? Words of encouragement, words that bring life to others and to self, words that do not cause dis-ease in others. If the last words you feel the need to utter are not bringing life to someone, do all parties involved a favor - don't speak. As fast as you can praise God, is as fast as you can lead someone away from God, just by not taming your tongue. Think about it. Storytime # 1 - That One Time He Wanted To Kill His Wife! Well, you know my transparency will either make you laugh, or, make you cry laughing. Today's story is no different. One day, I met this guy at the Sherman Oaks 24 Hour Fitness, and, well... Watch for yourself! This quote is so true. As soon as I started back to my passions, I started to smile again. Unhappiness is work for me. I surrendered my life back to my passions, and I'm not looking back. I'm sure depression will try to creep up again, but, I will be prepared. This I know for sure: happiness is your responsibility. It cannot be placed on income, a job, school, friends, or mates. Your internal happiness is your responsibility. What you project outward is a reflection of who you are inside. There may be things you need to work on - this is a good thing. Keep setting goals, achieving them, and setting more goals. You are here for a purpose, and that purpose cannot be actualized if you are stuck in despair. What do you love? Do you even know? If not, then it's time to pause everything else, and take some time to figure out what you're passionate about. That's a good place to begin. I DON'T LIVE IN A WORLD OF MAKE BELIEVE. I help several (over 20) people per month, and take in their energy, while giving out my own. I'm looking for a better way to serve more people, but for now, it's all me, all the time. Not complaining, just explaining. I'm also a full-time mother of twins, so I spend the bulk of my not-so-free time with them, teaching them colors and numbers and alphabets. At some point, I lost balance. In the midst of taking on the issues of others, something happened that rocked me - I found out one of my clients had been lying to me the whole time we worked together. I felt like a bad coach; all of the milestones I thought we had reached together were all lies. I think that was my breaking point. WHEN YOU LOOK AROUND, ARE THE PEOPLE YOU'RE SUPPORTING, SUPPORTING YOU? At this same time, in my personal life, I found that I was giving too much of me out to some people who were giving me nothing but negativity. When you have a giving spirit, you want to help everyone, and even I tell people that's impossible yet, here I am trying to do just that. What are you looking for in your relationships? Are you looking for loyal friends, people who are going to check on your in a consistent manner, or are you looking for someone who is distant but still there when you need them? When you are giving and not receiving, either the other person doesn't know, or they don't care. Don't lie to yourself - only you know which is truly is. I ALSO REALIZED THAT I'VE BEEN PUTTING OFF MY PASSION - WRITING. I love to write, but had not made time for that in my schedule. No matter how good my time management was, I didn't budget this in. While I'm helping others live their passion, I'm not living my own. I know things have to change, and now, I'm working with like-minded people to make these changes. I've gotten more personal work done in the last two days than I have in the last month, all because I have an awesome friend who sits on Skype with me and challenges me to move forward. We don't do, "stagnant". DO THE WORK, NO ONE CAN DENY THE WORK. I love being around people who are similar to me. These are people I don't have to tell how to be around me, because they know how to be around me. I love that I don't have to deal with inconsistencies, and when I allow people who are pulling me down into my life, I'm grateful I have the gift of discernment to know when to back up or walk away. I am back to doing my internal work, because I know that my life's purpose is to serve others and in order to serve others, I have to get back to serving myself. More to come. Have a great weekend. I have been enjoying this much needed vacation from social media. I've had a lot of time to read, write, and I am excited and at the same time in awe of God's presence in my life. In the midst of this change, God sent me a friend that most people would die to have; a compassionate, affectionate, and honest person who loves me unconditionally despite my flaws and continues to amaze me on a daily basis. I have battled storms as many of you have over the last few months, and one of the things that I always do is teach you while I am being taught. This blog goes out to my friend who has / continues to teach me what it's like to be Christ-like. The pain and frustration of learning that which God yearns to teach us can sometimes be overbearing, but to survive life you must be a warrior and adopt a stronger demeanor than the average person. What are YOU going through that you CAN'T talk to anyone about? What dreams have YOU ALLOWED to become DEFERRED in place of fear, doubt, and worry? ADVERSITY IS GOD'S WAY OF GIVING YOU GUIDANCE AND INSTRUCTION. I remember when I was losing weight and I really wanted to push myself to the limit. I had never been bungee jumping before but had always wanted to go. I consider myself to be daring, and the idea that I would be jumping off a bridge was too tempting to refuse. The hike was the most challenging part of the whole trip. Though I had been hiking in the Santa Monica Mountains for weeks, I was not prepared to depend on my balancing act on a fallen tree and a rope to get me across the swift current that had me afraid of being carried away. I can recall zoning out and all of my thoughts went to crossing safely while still having fun. All of a sudden, I became "G.I. Self-Esteem Queen"and crossed right on over with no problem! I WAS BEYOND EXCITED! God showed me that once I took the fear off crossing and put my thoughts on the fun I was having, it became a joyous experience for me. I have learned that what God does for others He more than desires to do for you. When I'm longing for Him to be closer to me, He's longing for me to be closer to Him. That feels so good! I stood there on the podium afraid that since I was close to the last person jumping that the cords somehow had gotten tired and would definitely give out on me - THE WRONG THOUGHTS TO BE HAVING BEFORE JUMPING OFF A BRIDGE! I stood there and thought about all the choices I made and how they affected my life. I thought about how God always came through in the nick of time when I would have to smile in public and cry in private at things I went through in my personal life. Delay is not denial when the goal is to learn by example even if the example is you learning from yourself. I looked down, smiled at God for allowing me to see just how much fun everyone before me had, and I jumped the heck off that bridge! FAITH REQUIRES YOU TO TRUST BEYOND THAT WHICH YOU CAN UNDERSTAND. Today is the day to return to that hobby, activity, or goal setting that had you fired up for life long ago. I'm not afraid of failing, I'm afraid of not trying my hardest to achieve my goals. I am always inspired by those who I see around me reach their goals and beyond. I stand before you encouraged for your future, and humbly accept my lessons so that my future can be bright and full of wisdom. I love you, and there's absolutely, positively, nothin' you can do about it!!! A lot of you were taught to believe that being INSIDE of a church brings you closer to God, but, what if you go to church and spend you time gossiping, judging how others are dressed, or lusting after someone in your congregation. A lot of you were taught to pray without ceasing, to know those few choice scriptures that will keep you grounded, and to keep your Bible opened to Psalm 23 for protection but, what happens when you live in the flesh instead of the spirit, over and over again when you know that leads you down a destructive path? Most don't know I studied theology for several years, and while I was born a Christian, I am a practicing Buddhist. I spend my mornings meditating and for the most part, I live a very peaceful life. There aren't a lot of people in my private space, and even being a busy entrepreneur and a full-time mother, I still make time to center my mind every single day. There is no work-eat-sleep-repeat in my life. I find that when I become mundane to the things around me, I get stuck in the same rut I ran from. Case-and-point: I am obsessed with having a clean house. Even with kids, I take a lot of time out to make sure that I'm cleaning as I go. While it takes more time, the adverse is me allowing it to build up, and then getting anxiety at having to clean it all up. That old habit of living around people who were functioning pack-rats is always in the forefront of my mind. I practice gratitude of my growth by keeping my space clean, and clear. Case-and-point: I'm helping a long lost friend I used to be in love with get over a death. There are moments when the conversation has the potential to lead us down memory lane, but, I remember the past, and how bad it made me feel, and I then continue to help with love, from afar, so I don't get caught up in the past drama. I've trained my mind to always go back to the focus of the reason I'm helping; to make sure this person can grieve as healthy as possible. If you've not already written down the habits that prohibit you from spending time with yourself, I encourage you to do that today. Then, write down what you SHOULD be doing in that space, and do this on a small 3x5 card which you can pull out at anytime as a reminder. My name is Dawn. I used to be a self-mutilater. You know me as the self-esteem queen. Every single day, I have to re-earn that title. 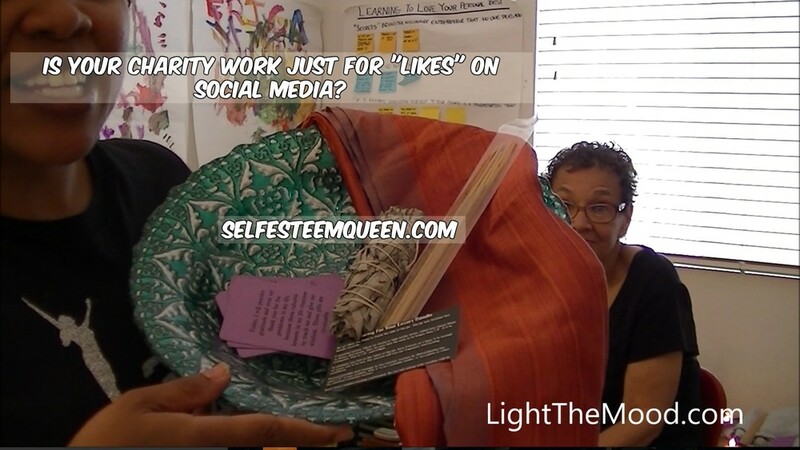 I also teach people how they can reach their own levels of being self-esteem queens and self-esteem kings. There's too much smoke, and lots of mirrors. No one talks about the real issues anymore. No one is looking to help others anymore; it's all about building a "brand" that looks good and altruistic, but is really set up under false motives. Healing others while going through things yourself is not a branding technique, and yes, even us, 'healers" have things we are healing from which is why we take the time to help others through their pain. On a bad day, my legs used to take a beating. I was in a very abusive relationship - with myself. There are no career heights, no amounts of money earned, and no amount of "followers", that can ever mute the voices of depression. They come in the deadest of silence, and they make sure that no one is there to interrupt them from freely speaking. Those of us who are able to maneuver around the voices of depression have stories to tell. One day, I will tell my story. Today, I just want to remind those of you out there who have those voices that tell you you're not worthy, you're not enough, you're not ever going to get past where you are now.... Please, continue to prove them wrong. I know it's a daily, and sometimes moment to moment battle, but I want you sincerely to come out on the living end. I do understand. Sometimes, when the voices get too loud, I used to cut. Now, I pray. Delay is not denial: Why the attacks of the enemy are on point. You've been looking at the attacks on your life, and the attacks on those you love, and you've been crying out to The Creator to relieve you from the experiences that seem to come, one after another. It hurts you to be vilified, hurt, lied on, lied to, humiliated, embarrassed, under-appreciated, and over-worked. You've wondered if your relationships will stand the tests, if your friendships are genuine, and if you're being a good parent, friend, daughter, or son. I'm here to tell you that if you're being attacked, you are also being protected. The tests come at the height of your blessings, and God is there, letting you now that all is well. It's at these moments you lean to the understanding that you don't understand. I'm weak most of the time. In this weakness, my power is restored, and I rely on The Creator to guide me down a path I can't see all the way down. All is well. If you're under attack, the breakthrough is coming, and you're on the right path. Be patient, and rely on The Creator. Spend less time online, and spend more time being grateful that there is light, and relief, on the other side of the rainbow.